03 Apr 2019 --- The supply of key fresh produce to the US could be under threat following President Donald Trump’s ominous warnings about abruptly closing the US-Mexico border. The President claims shutting down the border is the only way to stop immigrants crossing and stem the flow of drug smuggling – but if he actually does follow through with his threat, what does that mean for trade across the border, in particular, the availability of products – such avocados and dairy? Experts warn consumers and producers on both sides could be severely hit. A border closing would wreak further economic havoc for the US dairy sector, according to leading US dairy organizations, the National Milk Producers Federation (NMPF) and the US Dairy Export Council (USDEC). As the world’s largest producer of the crop supplying 45 percent of the international avocado market, Mexico has a long-established trade relationship supplying a large proportion of avocados to the US, which has become heavily reliant of avocado cultivars such as Hass and Fuerte, known for their good quality, size and taste. Speaking with FoodIngredientsFirst, Monica Ganley, Principal at Quarterra, a consultancy specializing in Latin American agricultural issues and trade, says if the border does close, retailers will first work through their remaining avocado stocks, then as supply tightens, prices would begin to move upward as a result. “I can't quantify retailer stocks but we can assume that as fresh produce, they wouldn't be large and the effect would be felt quite soon. Significant volumes of avocados are imported from Mexico throughout the year, but over the past few years we have seen import values peak in April and September. In 2018, the peak was in April with over US$200 million worth of avocados imported during the month,” she explains. There are dozens of products that would be affected, particularly fresh fruit and vegetables, she stresses. “In addition to avocados, the US imports millions of dollars worth of tomatoes, peppers, berries, cucumbers and other produce. Apart from produce, other imported products include beef, nuts and consumer products such as snack foods and alcohol. This doesn't even begin to address the issues that agricultural producers in the US would lose a major market for their products if the border was closed,” Ganley adds. Click to EnlargeFood cannot be used as a bargaining chip in solving immigration issues, say some, while the US Chamber of Commerce warns that closing the US-Mexico border is a sure fire way to tank trade markets. A border closure would also send shock waves through the US dairy industry, closing off access to its largest dairy export market, according to the NMPF and the USDEC. The dairy industry is suffering through one of its worst economic periods in history, as low milk prices are already creating hardship for farmers, and further supply disruptions would only prolong producer difficulties. Dairy exporters already have diminished access to export markets due to high tariffs and lack of progress on US trade agreements and closing the US southern border to Mexico would set the industry back by a decade or more, according to industry organizations. “It’s difficult to gauge the likelihood of this proposal becoming reality, but the ramifications of it would be serious enough that it is important for us to speak out now,” Alan Bjerga, Senior Vice President, Communications at NMPF, tells FoodIngredientsFirst. The NMPF is on standby to engage the administration on this issue and work with other sectors who share its concerns. “We will point out the importance of dairy trade with Mexico and the ramifications that would be felt across the dairy economy, as well as the broader US economy, should actions be taken that would seriously damage commerce with our southern neighbor,” Bjerga explains. Mexico is US dairy’s largest export customer, purchasing US$1.4 billion in 2018. There is not a ready alternative market for the millions of gallons of milk that are converted into the thousands of tons of dairy ingredients and cheese shipped to Mexico. “It’s very difficult to fathom the impact closing the US-Mexico border would have on US agriculture, and both the American and Mexican food industries,” says USDEC President and CEO Tom Vilsack. 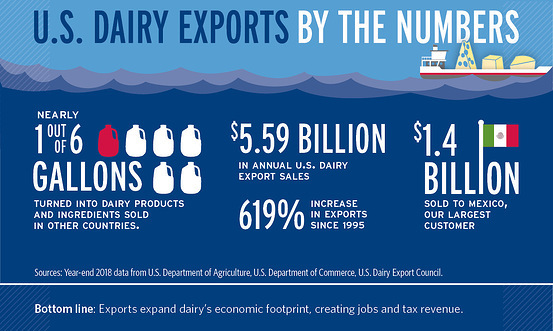 US dairy exports totaled US$5.59 billion in sales in 2018 – an increase of 619 percent since 1995. Mexico and Southeast Asia are America’s top two dairy export markets, accounting for 39 percent of total annual export value. USDEC has spent more than two decades building the market for US dairy products in Mexico. Vilsack also notes that as bad as a southern border closing would be for the US dairy industry, it will negatively affect their friends and colleagues in Mexico, given the dependence of its consumers on US products. Could avocado supplies be toast? A border shutdown would seriously disrupt the trade of food with the US reportedly at risk of running out of avocados within three weeks. 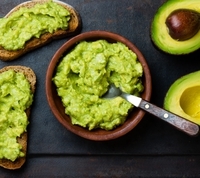 A border closure would inevitably hit consumers, push up prices, disrupt market conditions and lead to shortages of the whole fruit as well as avocado products such as guacamole – a firm favorite in US households and in the foodservice arena. Despite California state being known as a large cultivator of the fruit, the US still imports from the Avocado Belt of the Mexican Republic including Michoacán and the State of Mexico, to keep pace with consumer demand. The exports of avocados from Mexico in the US reached 1.7 billion in 2016, according to avocado trade body Avocados from Mexico (AFM), as US per capita consumption of avocados has increased seven-fold from 2000-2016. Other avocado products such as avocado pulp, avocado paste and guacamole are also extremely popular exports. Billions of dollars worth of trade would be impacted as a result of a border shutdown with approximately US$137 billion of that being food. Other products that could be impacted by a border shutdown include Mexican limes and tequila. There are also concerns about Mexican grown fruit and vegetables, including cucumbers, tomatoes, raspberries and blackberries. “The US exported over US$19 billion worth of agricultural products to Mexico in 2018. It is completely unrealistic to believe that we could cut off trade with Mexico without US producers being hurt in the process,” Ganley adds. President Trump does have the power to pursue the border closure, but this highly controversial proposal will likely face multiple legal challenges on behalf of the people and interests that would be affected. However, many reactions to Trump’s border closure threat are much more prudent, claiming a common sense approach is needed and not to overreact to such a threat as this is another example of posturing by President Trump. On the other hand, President Trump did go through with his threats to shut down the US government for four weeks from December 22, 2018, until January 25, 2019. US Mexico Border Shutdown Avocados Dairy Fruit Vegetables Agriculture Trade National Milk Producers Federation US Dairy Export Council Quarterra.